Did it look like the photo on the pattern once finished? Yes. But the last two are is giving me licks. Think I’m not fully grasping some part of the instructions for those. Were the instructions easy to follow? Sascha’s written instructions did give me pause more than once, but her videos clarified every step. I had tinkered with simple crochet cables earlier this year, when I made some washcloths for the kids, but I was always a bit wary of the curved fancier looking cables. Until now. 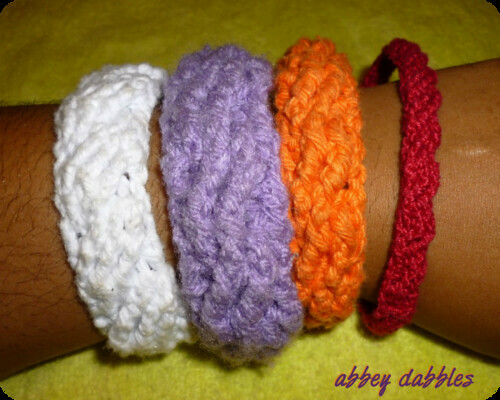 After doing these bracelets, I felt like no cables would be difficult ever again! Any likes or dislikes about the pattern? I liked how quickly the design forms, so you know you’re going right by row 3. I’m also pleased that the pattern looks good in both cotton and acrylic yarn, as well as cotton thread. Especially loved the Simple Large Cable Bracelet, whereas the Braided Bracelet, though the most beautiful of the five, is giving me the most trouble to attempt. Possibility of crocheting it again? To be honest, I made 10 in one sitting. Yes, ten. And I had to force myself not to make any more right now. But I definitely will make more in some neutral colours that I can wear with casual outfits.